Catch the World Cup Final? If you did watch it, perhaps you were tweeting your way through it, too. A couple of hours after it was all over, Twitter revealed that 32.1 million messages were posted during the game, which saw Germany beat Argentina with a goal in extra time. 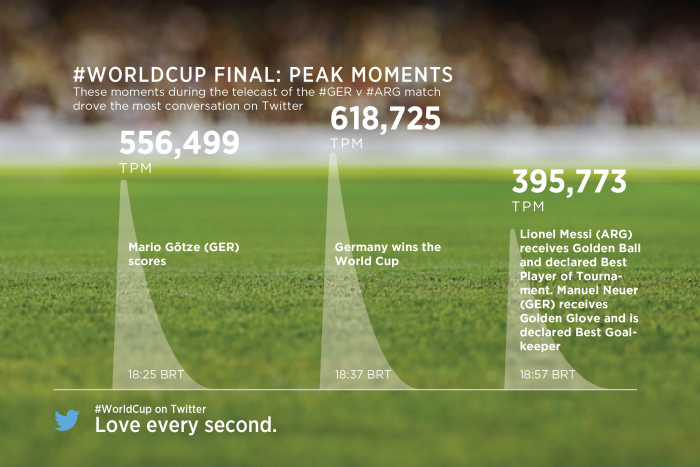 The social media giant no doubt wished it could’ve proudly announced the figure as “a new Twitter record!”, but Germany’s sensational pummeling of Brazil in the semis last Tuesday took that honor, with 35.6 million tweets posted. The final game, watched by an estimated one billion people worldwide, kicked off at Brazil’s fabled Maracana Stadium in Rio de Janeiro on Sunday afternoon local time. Götze’s superbly taken goal generated 556,499 TPM, while the awkward post-match moment where a miserable Messi had to go up and collect his player-of-the-tournament award and then stand with German goalkeeper Manuel Neuer, who’d just picked up the best keeper award, generated an impressive 395,773 TPM. We guess most of them said, “Messi?!? Player of the tournament?!?”. Wiltshire’s post also included an odd-looking pulsating map (below) showing “how the entire match played out on Twitter around the world.” I’ll be honest, watching this blob-filled animation do not-very-much was only marginally more interesting than last week’s excruciatingly dull semi-final clash between the Netherlands and Argentina, though there is an attention-grabbing moment at the 18:20 mark when Germany score their late winner. And look, someone in French Polynesia was tweeting occasionally, too. The blog post also pulls together various images tweeted after the final whistle, including several by members of the German team. Angela Merkel even found her way into some of them, possibly creating a new Twitter record for the number of tweeted images featuring a world leader with a winning sports team.